You are at:Home»Software Guides»Does Windows 10 Need Antivirus Software? A matter of some debate is whether or not you actually need a third party antivirus program for Windows 10. This is because Windows 10 comes with its own Windows Defender antivirus software. The question is whether or not it’s enough for protecting your computer. The short answer is yes, for most people. The long answer is that it depends on your individual security needs. Read on for our detailed investigation. 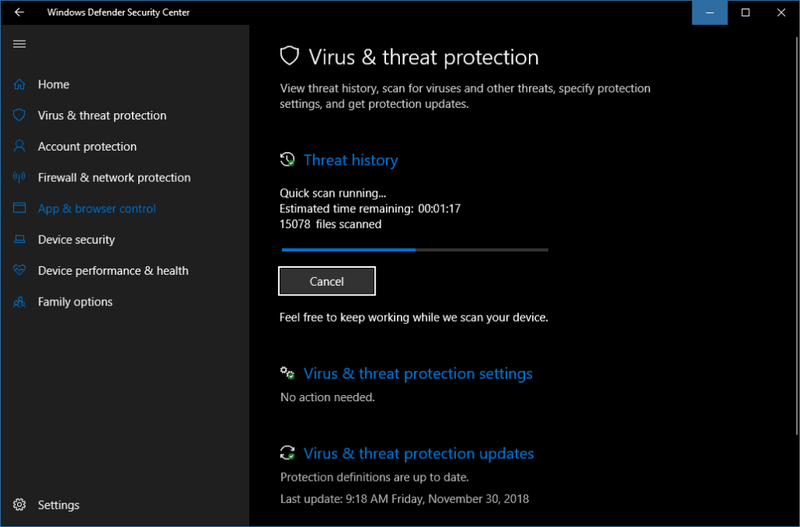 Windows Defender functions as both antivirus and anti-spyware software in Windows 10, but started as just anti-spyware software on earlier versions of Windows. Most of us likely first came to know Windows Defender from either Windows Vista or Windows 7 on which it came built in. But it’s actually been around much longer and has gone through several changes. It started as a beta anti-spyware program in 2005 before becoming a fully fledged program in 2006 for Windows XP and Windows Server 2003. In addition to Windows Defender there was a separate free antivirus program called Microsoft Security Essentials available for Windows 7. Much of this program was later incorporated into Windows Defender for Windows 8. This allowed Windows Defender to detect and remove viruses as well, making it a general anti-malware program. 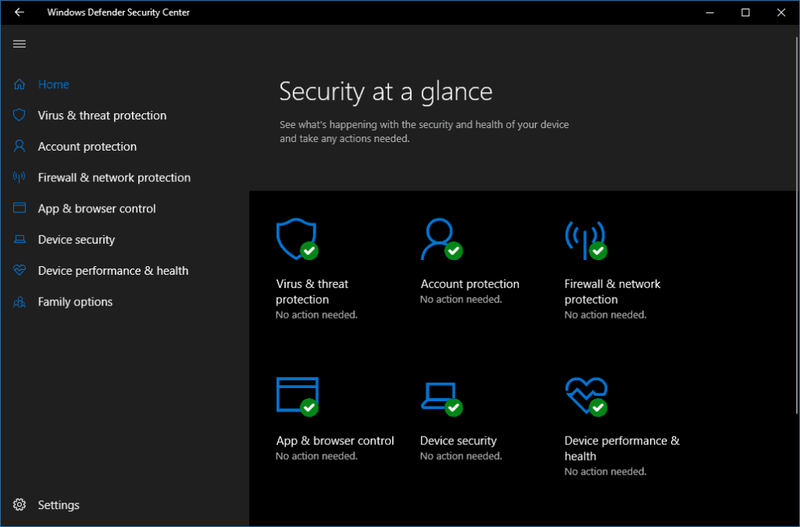 In the latest versions of Windows 10 it has been made a part of a larger batch of security controls called Windows Defender Security Center. 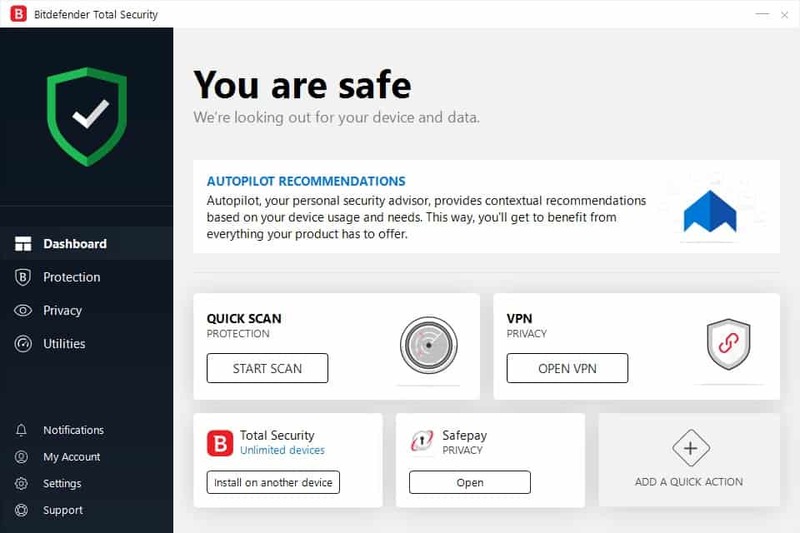 This security center offers several built in security features to monitor your computer’s status and help keep it safe. It can also work with 3rd party antivirus software instead of its own. How does Windows Defender compare to other antivirus software? In the past Windows Defender had much lower virus detection rates than other program, but recent scores have it neck and neck with the major antivirus providers. It even exceeds some of them. This is especially good when you consider that it’s completely free and won’t hassle you to pay to upgrade. If you want a low maintenance, easy to use free antivirus, just sticking with Windows Defender may be your best bet. How does it compare to security suites like McAfee’s or Norton’s? While it may be enough to stop common spyware and viruses, Windows Defender may not be enough to stop rarer, more specific types of malware, like ransomware. It also may not be enough to protect you against other types of security threats, like phishing. This is where getting a paid program can be a good idea, specifically a full security suite, like the ones offeder by Mcafee, Norton, Kaspersky, and so on. They’re designed to detect and stop as many types of threats as possible. These security suite programs can also include several other helpful features, like an advanced firewall, email spam protection, and tune-up software for improving performance and clearing unnecessary files. Some also have features like data backup, personalized security alerts and parental controls. Backup features can be important for those that have critical data they can’t afford to lose and parental controls are good for those concerned about their kids’ computer usage. How does it compare to general antivirus/anti-malware? Having lots of security features in one package can be very handy, but also quite expensive. It’s also true that not everyone wants or needs things like personalized security alerts and parental controls. For those who don’t need all of the features these premium security suites offer, there are also lower tiers of software with lower prices. These programs will be enough to protect your computer from nearly all types of malware without breaking the bank. If you do want some or all of the features that security suites offer without paying a premium, there are lower cost and even free programs available that can do much of the same things, like cleaning utilities and password managers. The downside is that you’ll have to use multiple separate programs rather than one collective suite. Using these programs with Windows Defender or another free antivirus is also a great way to have excellent protection without spending a dime. What free programs to use alongside Windows Defender? 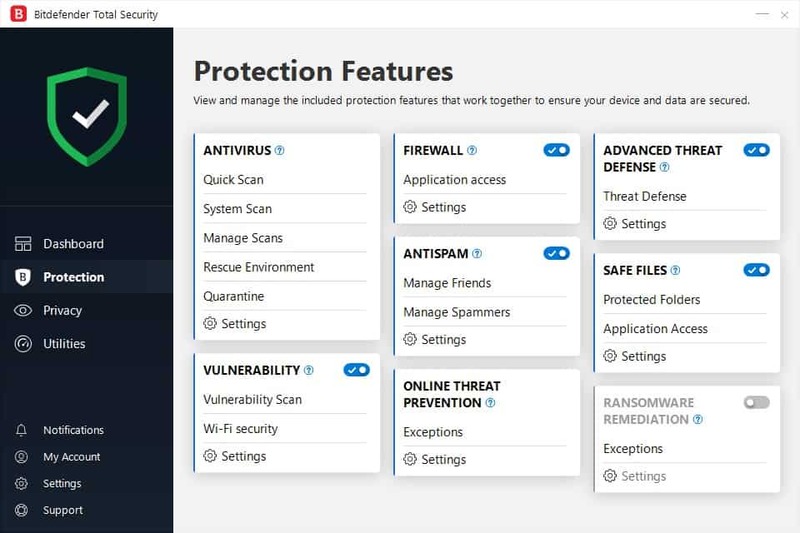 There are additional programs you can use to do what Windows Defender can’t. I and many others recommend Malwarebytes for the job. 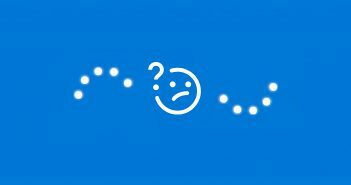 It’s great at detecting and removing malware that Windows Defender often misses. It comes in a paid version and starts as a free trial, but its basic features can be used for free indefinitely. SUPERAntiSpyware is another great option with a free version. If you decided to go for an antivirus or security solution instead of Windows Defender, read on, I will be giving my recommendations for the best software to choose. I will also have a section covering the free utilities mentioned earlier. One of the main factors will of course be price; how much you’re willing and able to pay. Others include ease of use, the performance impact it has and most importantly, how well it protects your computer and your data. We’ll be going over three different alternative software setups and how they compare on these factors. Security suites tend to be quite expensive, but are a great choice for those who want convenience, ease of use and the most complete protection possible. Of all the security suites available, the one I’d recommend most is Bitdefender Total Security. Provides comprehensive protection across platforms. Includes several extra features like Anti-Theft, webcam protection, parental controls, file encryption and a password manager. Autopilot can make maintaining your system easy. Those with an iPhone or iPad will find the iOS security app lacking. 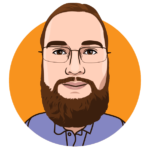 Dealing with false positives and overly zealous file and folder protection from the Safe Files and Ransomware Remediation features can be a hassle. One of the features that really sets this security suite apart from a regular antivirus is that it can provide cross-platform protection. This means that when you buy Bitdefender Total Security it can also protect your Android and macOS devices if you have them. An app for iOS devices exists as well and works with the suite, but it’s actually separate from it and does not provide the same features or level of protection as the others. That being said, with one licence you’ll be able to keep your PCs safe as well as any smartphones and tablets you may have. The normal version provides protection for up to 5 devices at the same time, but you can upgrade this to 10 devices for a bit more. Unless you have an unusually large amount of computers and smart devices, one of those options should be enough to keep all of them safe. It’s also worth mentioning the iOS app does not count towards the device limit. The main section of Bitdefender Total Security is known as the Dashboard. It shows Autopilot security recommendations at the top and links to other modules/sections of the suite at the bottom called Quick Action links. Autopilot is what Bitdefender calls “your personal security adviser”. It provides automated suggestions for things such as keeping your computer safe and improving performance. They’ll appear both as popups, which can be disabled, and on Autopilot section of the Dashboard. It’s not perfect, but following its suggestions should help keep everything on your PC running as it should. The usual features, like scans, real-time protection and a firewall are found in the Protection section and work as expected. Features like Safe Files and Ransomware Remediation help keep your files from being altered by any malicious programs. As can happen with any security program, false positives for both malware detection and file/folder access can occur, especially with games. You can add exceptions for known safe programs and exclude folders from protection when this happens. You can even disable a feature altogether if it causes too much trouble, although you’ll reduce your security by doing so. There are also features like a password manager, file encryption, parental controls and VPN in the Privacy section, although the VPN only includes 200MB of data daily for free. A separate service is needed for unlimited use. In additions there’s a Webcam Protection feature which notifies you when programs try to access your webcam and allows you to block or allow access. Optimization and cleanup tools can be found in the Utilities section that help stop resource hogging programs during startup and remove unneeded files. This can be done either individually or all at once with the OneClick Optimizer. There’s also the Anti-Theft feature which helps you locate any stolen or lost devices and also lets you remotely lock or wipe them to protect your personal data. Bitdefender Total Security indeed does a good job at providing total security for your devices, but it’s not without its downsides. On that note, something to be aware of is their have been complaints about the auto-renewal system for payment. Some have said they’ve been charged early and had difficulty getting a refund. It’s also been reported that you will not receive any discounts that are available if you opt to automatically renew payment. Therefore it’s recommended to make sure to opt out of auto-renewal at checkout to avoid surprise withdrawals and to always get the best price available each year if you decide to buy. Overall Bitdefender Total Security is a great option for those who want top notch protection for their devices. The price for 5 devices and 1 year of protection is normally $89.99, but can often be found on sale. As of the writing of this article it is $44.99 on the official website. For something less expensive than a security suite, but more advanced than free antivirus, Webroot’s SecureAnywhere antivirus software is a good option. It’s available for both Windows and macOS devices and comes in 1 device and 3 device license options. While it won’t protect all your smart devices, it’ll provide great protection for your main computer(s). Always up to date with its constant internet connection. Designed to protect even against unknown threats. Always needs an internet connection to work properly. Only protects a small number of devices, either 1 or 3. Webroot’s offering is different from other antivirus software in that it’s a very small program that runs mostly through the internet. Rather than downloading a large detection database to your computer and running against that, it checks files against a database in the cloud. The downside to having the detection being done almost entirely through the internet is that you need a constant connection for it work properly. This shouldn’t be a problem for most users though, as usually the only time a new file would be introduced to your computer is while you’re already online. If somehow you do end up in a situation where you put an unknown file on your computer while you have no connection, there’s still limited built-in heuristics that will temporarily block any suspicious files. Once internet is restored it will check the file against the database and decide what to do with it. Data usage may also be a concern for those with metered connections, but Webroot SecureAnywhere manages to use a very small amount of data for its operations. 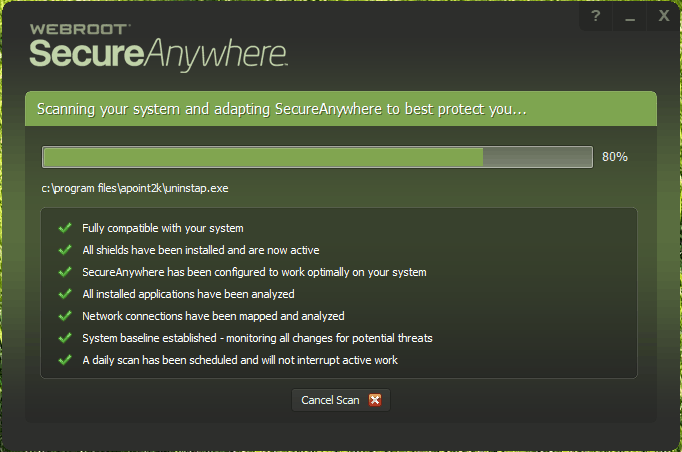 Webroot runs a full scan and does a variety of other setup tasks surprisingly quickly during the installation process. In addition to being fast and taking up little disk space, it also has a very minimal impact on system performance. As nearly all antivirus programs, Webroot offers real-time protection, but also runs a scan every day. So even if you never run a manual scan you shouldn’t need to worry about viruses being missed. Although presented mainly as antivirus, Webroot SecureAnywhere offers protection against all types of malware. This includes ransomware and rootkits. Even when never before seen suspicious files and activity are detected, Webroot will begin monitoring the process and backup the files being effected. This way any changes can be undone if determined to be malicious. Webroot SecureAnywhere also offers identity theft protection and real-time anti-phishing features. This way your important personal information should stay safe. Webroot even has a webcam protection feature similar to BitDefender’s. There are also more expert geared features like the SafeStart Sandbox, but most users won’t be using those. It’s worth mentioning there have been some complaints that their tech support is hard to get a hold of or unhelpful. Unfortunately this tends to be a common complaint for many companies. There are also users who say Webroot’s tech support is great, so your experience may vary. As with Bitdefender’s offering, I’d also recommend not doing auto-renewal with Webroot. This is because you’ll always be charged full price with automatic payment renewal. To get the lowest price it’s best to shop around first, both for the initial purchase and renewing. Ultimately the choice is up to you of course, whether you prefer the best price or convenience. Bottom line, for a lightweight but advanced antivirus program that’s reasonably priced, Webroot SecureAnywhere AntiVirus is a great choice. It normally costs $39.99 for 1 year and 1 device, or $49.99 for 3 devices. On the official website it’s currently on sale for $29.99/$37.49. It’s also currently available on Amazon for only $19.88 for the 3 device version, as either a download or CD-ROM. If you want a free antivirus but don’t want to use Windows Defender, Avira is a great alternative. It’s one that I’ve personally used for quite some time. Avira doesn’t really stand out from the crowd, but it does an excellent job for a free program. Avira is easy to install and use. Provides excellent malware protection, especially when combined with SUPERAntiSpyware. Free version of SUPERAntiSpyware must be updated and ran manually. Avira’s browser extensions are disappointing. Upgrade pop-ups can get annoying. It’s pretty easy to install and doesn’t require that you create an account to use it like most antivirus software does. Detection rates for malware are good, but not as high as Webroot’s. 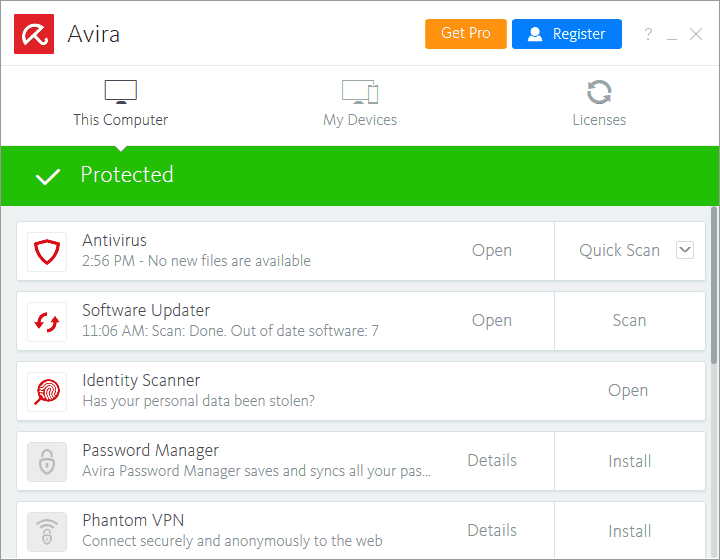 Besides real-time protection and different scanning options, Avira doesn’t have much in the way of features, but that’s expected for a free version. For web protection there is a browser extension you can install, but it’s only available for Firefox and Chrome. Its anti-phishing detection rates also tend to be lower than those of Firefox and Chrome themselves. There are a variety of other free tools and utilities that can be added to Avira from within the program. The Identity Scanner simply takes you to website where you can enter your email to check if any of your accounts using that email have been compromised. Software Updater helps keep your system secure by checking for and showing available updates for your programs. The others are mostly self-explanatory and all worth a try if you think they’d be helpful. Do be aware that many of them will advertise their more fully featured paid versions. Speaking of advertising, Avira will show pop-ups asking you to upgrade to one of their paid versions fairly often. Luckily they can be easily closed and aren’t as intrusive as other free antivirus software’s self-advertisements. Avira does provide protection against other types of malware than just viruses, but not as comprehensively as other programs. Because of this it’s recommended to also have a supplementary anti-malware program. Malwarebytes is usually the best software for the job, but one downside is Avira and Malwarebytes can conflict with each other, especially with registry changes. This is partly because Malwarebytes is mainly meant to be a stand-alone product. You can temporarily disable Avira’s real-time protection to try to avoid conflicts, but that may be more hassle than you’re willing to deal with. To avoid this problem altogether, SUPERAntiSpyware is great option for a supplementary anti-malware program. It’s actually designed to work with your antivirus software, so you won’t have to worry about any conflicts. Despite “antispyware” being in the name, it also stops ransomware and other malware. 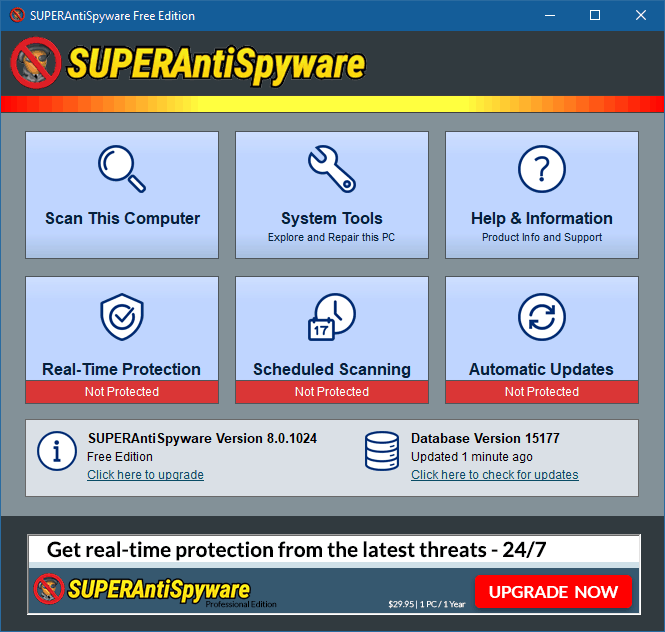 The free version of SUPERAntiSpyware offers great protection, but requires that you scan manually in order to detect malware. The same is true for the free version of Malwarebytes. You also need to update SUPERAntiSpyware’s malware detection database manually. For automatic protection, you’ll need to get the premium version, which is $29.95 a year for 1 device. So if automatic protection is important to you, you may be better off with Webroot’s offering. 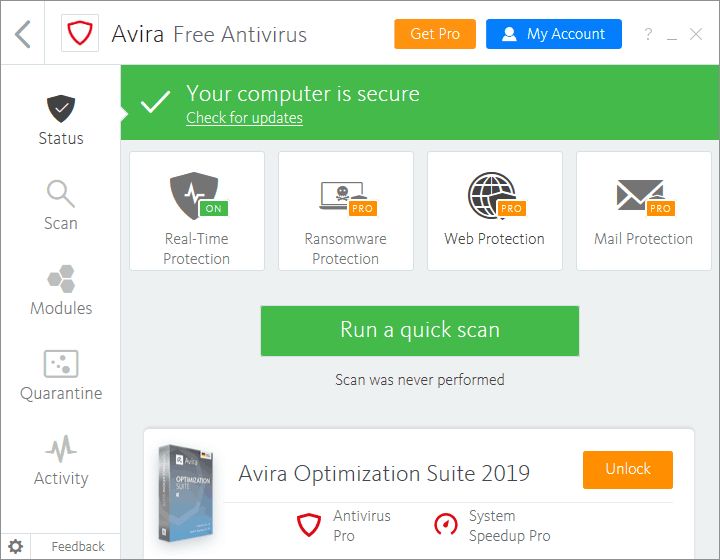 Free anti-malware will never be as comprehensive as paid versions, but the free versions of Avira and SUPERAntiSpyware make a pretty good team. When it comes to free malware protection, you aren’t going to get much better than Avira and SUPERAntiSpyware together. If you’re fine with manually updating and scanning, as well as upgrade advertisements, this combination should provide a good experience. As briefly mentioned earlier, there are some of the same types of utilities that are available with paid software available for free. These programs should be able to be used in conjugation with any of the antivirus options mentioned in this guide. 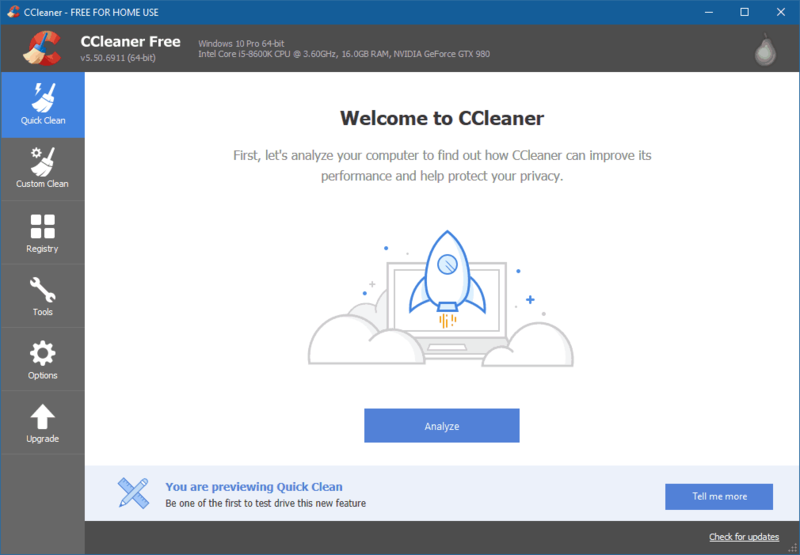 For example, CCleaner is great software that comes in a free version. It can clean up junk files, remove unneeded registry entries and manage startup programs. For managing passwords, LastPass is a great option. It works as a browser extension that can securely store your passwords, notify you of low security passwords and automatically create secure ones when signing up for an account. There’s a premium version available that can manage application passwords and has a few advanced features, but most users can stick with the free version. Going back to the question from the beginning, is Windows Defender enough? In my opinion the answer is yes, but what’s best for you may be different. All the options we’ve covered should provide good protection for your system. Balancing price, protection and convenience is the main goal. Bitdefender Total Security provides the some of the best protection you can find and convenience with the multitude of security, privacy and performance features it has. Webroot provides great protection with a small and lightweight program at a reasonable price. Avira and SUPERAntiSpyware can be a bit higher maintenance, but provide malware protection at no cost. I personally feel the best balance of convenience and protection comes with combining Windows Defender and either Malwarebytes or SUPERAntiSpyware. You’ll need to scan manually on a fairly regular basis, but Windows Defender itself is very low maintenance. It updates itself automatically and provides good real-time protection. 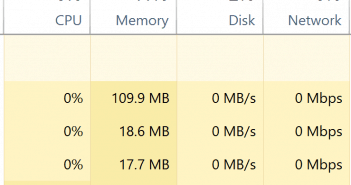 As it’s built in to the system there’s almost no performance impact and you also don’t have to deal with upgrade advertisements. Hopefully this guide has helped you decide which of these solutions will work best for you. If you have any questions, feel free to ask in the comments.